Pyongyang, June 16 (KCNA) — The league match of the 2010 World Cup between the DPRK and Brazil took place at dawn (Pyongyang time) on Wednesday. From the outset of the match the two teams fought a seesaw battle. The DPRK footballers created good shooting chances, not losing their confidence even after losing two goals. At about the 88th minute of the match Jong Tae Se headed the ball before passing it to Ji Yun Nam who powerfully kicked it into the rival’s goalmouth, scoring a goal. The DPRK team will meet its Portuguese rival on June 21. The North Koreans are back in the World Cup after a 44-year absence. But some may wonder why they bothered to come. The Brazilians, who play in the tournament every four years, have more than 500 journalists following them here. The North Koreans, in only their second World Cup, brought two photographers, two TV reporters and one writer. In the U.S., where soccer is still considered a minor sport, more than 136,000 World Cup tickets were sold. In North Korea, where the team is making history, the national soccer federation distributed 1,400 tickets. In South Africa, a soccer game is a thinly disguised reason to sing, dance, scream and blow on a vuvuzela for hours. The North Korean fans handpicked to attend their country’s World Cup opener Tuesday displayed all the joy and spontaneity of accountants attending a seminar. That the game — played in a wind chill of 24 degrees — ended in a 2-1 victory for Brazil was predictable. That several hundred North Korean fans were on hand to watch it was not. China’s state-run news agency has reported that North Korea had offered tickets to sporting officials and tour agencies in China, which does not have a team here. Chinese journalists in South Africa had adopted the North Koreans as their own and, the news agency reported, about 1,000 Chinese dancers and musicians were recruited to cheer for the North Koreans. But shortly before Tuesday’s game started, a five-row block of seats on the second level at Ellis Park Stadium filled up with more than 40 men and a woman, all dressed in identical red shirts, jackets and scarves, wearing identical red caps and waving small North Korean flags. Across the way there was another similarly sized red dot of fans in grandstands that were otherwise filled with the green and yellow of Brazil. Kim Yong Chon, 43, one of the North Korean fans, said the group, which numbered 300, was not Chinese, but he admitted they had been carefully recruited by the North Korean government to make the trip. Speaking through an interpreter, he said the group had left Pyongyang, North Korea’s capital, and traveled through Beijing the same day and they would stay in South Africa as long as their team does. They sang the North Korean national anthem loudly but sat passively, almost expressionless, through most of the game, with one man sucking on a beer. They spoke only infrequently to one another — Chon said they didn’t know one another before coming to South Africa — and mainly reacted to the action on the field only when directed to do so by a man who stood before them like an orchestra conductor. Few of the men bothered to acknowledge the non-Korean fans, following the lead of their team, which was hidden on a private floor of a luxury hotel, failed to show at news conferences and banned outside journalists from its training sessions. FIFA has chosen not to challenge the team over media availability, so after Tuesday’s game, while members of the Brazilian team spoke at length with reporters, most of the North Korean players brushed by. Only a handful bothered to stop at all, most notably star striker Jong Tae Se, who cried during the playing of his country’s national anthem. And he was quickly shooed along by members of the North Korean delegation. Perhaps all this would have gone unnoticed had North Korea opened against another team that plays a staid, defensive game. But against the passionate Brazilians and their samba-dancing fans, the contrast was stark. But Chon at least tried to acknowledge the tenets of international friendship and cultural exchange events such as the World Cup are supposed to engender. “We will also be supporting South Korea,” he said, mentioning the country that North Korean Coach Kim Jong Hun had refused to acknowledge a day earlier. “Our hearts are with them too. The Daily NK can reveal that the roughly one hundred North Korea supporters at the North Korea v Brazil football match on Tuesday night were North Koreans already in Africa earning foreign currency for the state. “Overseas Construction Company” is a government department managing personnel and their lives on construction projects abroad. North Korea has several hundred such people in African countries. The Mansudae Art Institute earns foreign currency producing statues and other public works of art in countries such as Namibia, Angola, Ethiopia and Zimbabwe, and most recently the 164-foot high, $27 million “Monument to the African Renaissance” in Dakar, the capital of Senegal, which was unveiled in April this year. After the authorities cancelled the original plan, they attempted to sell the 65 free tickets they received from FIFA for each of North Korea’s games through overseas offices. However, that also failed. The authorities were reportedly asking $169 per ticket. According to Yonhap, the group refused to reveal any further information about how they came to be in Johannesburg, but did say they intend to be at every one of the North’s matches. North Korea’s TV station legally obtained the rights to broadcast World Cup games in a deal brokered by Malaysia-based Asia-Pacific Broadcasting Union on behalf of broadcasters in five countries, the union said Tuesday. North Korea’s rebroadcast on Saturday of the opening game of the World Cup surprised South Korea’s tournament broadcaster, which feared the North was pirating its signal after refusing to come to terms for sharing its rights to the event. But when the controversy came to the attention of World Cup governing body FIFA, it said it had signed a broadcast agreement with the Asia-Pacific Broadcasting Union to send video of the games to North Korea. The union confirmed the deal on Tuesday. A person in the union’s sports department said the deal was reached just before the tournament started Friday for TV stations in East Timor, Kyrgyzstan, Laos and Uzbekistan, as well as North Korea. Terms weren’t disclosed. The union is a nonprofit organization of broadcasters in 58 countries that facilitates the exchange of news and entertainment programs. North Korea illegally used some South Korean broadcasts of the 2002 World Cup, but in 2006 it made an arrangement to obtain TV coverage legally from a South Korean network. Its state broadcasting system held two meetings with the South Korean TV network SBS, which purchased broadcast rights for the Korean peninsula from FIFA, for a retransmission arrangement on the current tournament, but the two sides couldn’t come to terms. When the North Korean TV station on Saturday showed a replay of Friday’s tournament-opening game between South Africa and Mexico, SBS officials said they suspected their signal had been pirated by the North. North Korea has since showed excerpts of several other games on a delayed basis. Analysts say the country is unlikely to show live broadcasts of its own team because of fears by its authoritarian government that the team will perform poorly or the prospect that protesters who dislike the North will be given screen time. North Korea’s coach, Kim Jong Hun, in a news conference in South Africa on Monday said he expected that the country’s games will be broadcast back home. North Korea was scheduled play Brazil, one of the tournament’s favorites, on Tuesday night in South Africa, early Wednesday Korea time. North Korea’s TV station typically broadcasts five to seven hours a day and doesn’t usually operate in the overnight hours when the game will be played. UPDATE 24 (2010-6-10): Here is a video clip of the DPRK team training in a local South African gym. 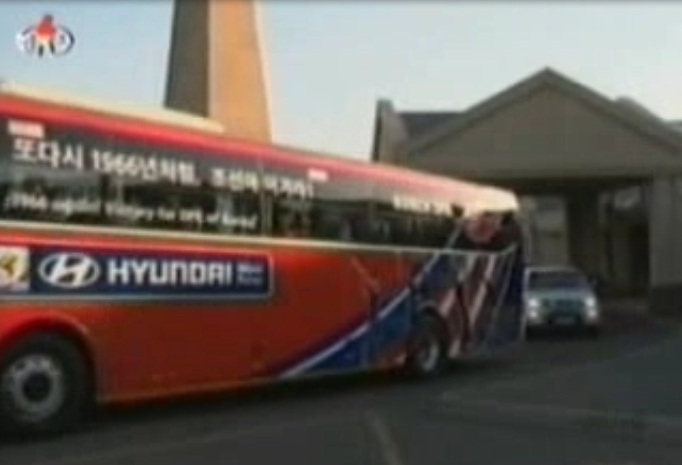 Also, it appears that Hyundai is providing buses for all the teams, including the North Koreans. Link here. An excited bunch of about 50 soccer fans are set to fly out from Tokyo June 14 for a historic game at the World Cup in South Africa. Not to watch Japan, though –- to follow their preferred team, North Korea. A majority of Japan’s 600,000 ethnic Korean population prefers to cheer for North Korea, rather than its southern neighbor. And as part of its World Cup promotional campaign, the North Korean Football Association of Japan (in Japanese), a Tokyo-based soccer organization that runs leagues for the North Korean-affiliated community in Japan, has organized tours to watch the games in South Africa, as well as selling team merchandise online. According to Lee Kang Hong, who works at the NKFA, there will be approximately 50 people from all over Japan traveling to South Africa to cheer on the “Chollima”, meaning winged horses, when they take on heavyweight Brazil in its first game on June 15. Mr. Lee, who will also be making the journey to Johannesburg, says the five-night trip to the host nation costs 630,000 yen ($6,900) per person. While there are two tours in the works, no one has signed up for the second trip to watch North Korea’s second game against Portugal, according to Mr. Lee. But the Portugal game looms large in NFKA’s Japan plans. A bright red t-shirt emblazoned with the slogan “1966 Again” might have proved popular with fans of England, still longing for a repeat of its only victory in the tournament. But the shirt actually recalls the near miraculous upset North Korea pulled off against Italy in the 1966 World Cup in England before succumbing in the quarter-finals to Portugal. The t-shirt is on sale for 2,500 yen ($27), while a scarf costs 1,500 yen ($16). Those with a bit more to spend can snag a replica of the team uniform for 12,000 yen ($130). But demand hasn’t been brisk so far: less than 100 items have been sold thus far, according to Mr. Lee. Still, the apparel will also be sold at the various organized festivities to be held in school gymnasiums and restaurants around Tokyo when North Korea takes the field in its World Cup rematch against Portugal June 21. Similar events were held in late May to send off the three players born in Japan who will be playing for North Korea and hail from the tight-knit community of Japanese-born ethnic Koreans who affiliate themselves with Pyongyang. As for the team’s prospects in South Africa, a repeat performance of the 1966 run would stun the entire world of soccer. But then again, the team wasn’t exactly a hot favorite 44 years ago either. For reasons that are not entirely clear, North Korea seems to have to learn everything the hard way. Take the World Cup, for example. The rules clearly state that a team must be made up of 23 players, three of whom must be goalkeepers. But North Korea decided to select only two real goalkeepers and named a striker as its third goalkeeper. The idea was to carry 21 field players compared to 20 for all other 31 competing teams. Cheating, is what it amounted to, really. But FIFA, decided that this was not at all sporting and has told North Korea that by designating forward Kim Myong-won as a goalkeeper means that he can only play as a goalkeeper during the tournament. In other words, the North Korean ploy backfired in two ways: The team has only two goalkeepers at its disposal — so an injury and a red card would leave it with none — and it can’t use Kim at all, unless it wants to put a forward in the net. Not that it matters in the long run. Coach Kim Jong-hun’s team plays Brazil, the Ivory Coast and Portugal in the first round, after which it will be on a plane headed home. All it has achieved by the bizarre move is to ruin what little chance it had, which was none. But perhaps that was the real ploy all along. Now North Korea can claim a conspiracy to deprive it of the right to field its best team. Not that North Korean fans will know anything about the tournament. The country’s oddball leader, Kim Jong Il, said last year that only North Korean victories could be shown on television. Since there are likely to be none of those, the fans are out of luck. Their fans in South Africa have been shut out, too, since North Korea arrived. The team has held four training sessions and has barred foreign reporters from all of them. UPDATE 21 (2010-3-15): North Koreans allegedly working on South African football stadiums. Football-mad North Korea will get 17,000 tickets to the World Cup… but NONE of their fans will be allowed to go. Despot Kim Jong-il will ­hand-pick just 200 of his ­pampered party officials to go to South Africa while ordinary people will be left at home. And in a bitter blow to ­England’s travelling army of 30,000 fans, we will get 2,000 FEWER tickets than the ­dictatorship for group stages. According to officials, Kim Jong-il, 68 – known to the ­Korean people as the Dear ­Leader – ­“proposed the tactics” which helped the little-known side finish second in their qualifying group. But while he revels in his country’s ­qualifying for a World Cup for the first time since 1966, his countrymen are banned from flying to South Africa. About 80,000 fans regularly watched the team’s qualifying campaign. But the 17,386 tickets the country will get for their games against Brazil, ­Portugal and the Ivory Coast are expected to find their way on to the black ­market. The official also said Kim Jong-il personally guided the team at the stadium during the crucial draw with Iran in April last year. The reason North Korea gets more tickets than ­England is because they are playing in two of South Africa’s biggest stadiums – Ellis Park in Johannesburg and Cape Town Stadium. Each country gets 9.8 per cent of the stadium’s capacity. As England are playing two of their group games in the smallest stadiums, their share is less. North Korea bestowed awards on players and coaches of its national football team for advancing to next year’s World Cup finals, their first entry in more than four decades, state media said Tuesday. Yang Hyong-sop, vice president of the Presidium of the Supreme People’s Assembly, awarded the merit citations and medals in a ceremony on Monday, said the Korean Central Broadcasting Station, an official radio channel. The football players “brought glory to the homeland and encouraged our military and people who are in a great struggle to build a thriving nation,” the report said. Among the award winners were Kim Jong-sik and Kim Jong-su, director and a vice director at the Commission of Physical Culture and Sports Guidance. They received merit citations of North Korean founder Kim Il-sung and current leader Kim Jong-il, respectively, it said. The team coach, Kim Jong-hun, and players also received honorary titles of “people’s athletic” or “merited athletic,” the report said. North Korea qualified for next year’s World Cup finals in South Africa for the first time since 1966. In that World Cup in Britain, North Korea beat Italy on the way to the quarterfinals before losing to Portugal. Sven-Goran Eriksson and Peter Trembling are heading to east Asia this week to hold final talks on a deal that could see the former England manager become the coach of the North Korea team at next summer’s World Cup. Trembling, the Notts County executive chairman, is understood to have been involved in talks with intermediaries representing the Football Association of the Democratic People’s Republic of Korea. Those negotiations were with a view to securing the Meadow Lane director of football’s services on loan. The process is now advanced enough for Trembling and Eriksson to be travelling to Beijing later this week on an eight-day trip. The club chairman is also expected to discuss Chinese business investment opportunities in Qadbak, the British Virgin Islands-registered investment vehicle that owns County. A source close to the deal confirmed that the trip to east Asia is going ahead and did not deny that Eriksson’s stewardship of the world’s 90th-ranked team was under discussion. North Korea’s embassy in London suggested there might be an announcement in “two or three weeks”. The [North Korean] government banned the [previous national] team from traveling abroad following defeats to both Japan and South Korea in the qualifying stages for the 1994 World Cup in the United States. The squad returned to the international stage in 1999 but skipped the 1998 and 2002 World Cups, and failed to qualify for the 2006 tournament. Only a few North Koreans players have signed for foreign clubs and the 19 players reunited in Nantes all play at home. According to Cadet, their trip in France was made possible by the French ministry of foreign affairs. “They immediately understood that the purpose of their trip was just about football,” he said. But the North Koreans will not be free to do as they please during their stay. Some outings as tourists are scheduled for them in Paris and in the Nantes area, but they always will stay together. UPDATE 16 (2010-6-3): Italian sports apparel firm Legea snagged the DPRK men’s and women’s football contracts. North Korea’s footballers will play three matches in France in October as part of their build-up to the 2010 World Cup, the Asians’ first venture into Europe for 40 years. The squad will be based near the western city of Nantes from October 5-15, the French organisers Sports Live Agency said. North Korea, who last qualified for the World Cup in 1966 in England, will take on second division side Nantes at La Roche-sur-Yon on October 9 and the Congo national team on October 13 at Le Mans. The date for a third game, probably against a French footballer’s union side, is being arranged. The North Koreans secured their place in the 2010 tournament in South Africa with a 0-0 draw away at Saudi Arabia last June. North Korean sporting officials claim that it was the invaluable tactical advice that the head of the state gave to the players that allowed them to win a ticket to South Africa in 2010, reports Choson Sinbo, a Japan-based newspaper published by the General Association of Korean Residents. “The Great Leader gave in-depth guidance on the development of Korean football. He proposed the game’s tactics most relevant for the physiological characteristics of the Korean players”, Kim Jong Su, General Secretary of North Korean Football Association, said. The official also said Kim Jong Il personally guided the team at the stadium in April last year. According to the newspaper, the Great Leader’s involvement allowed the Korean footballers to show their own game and cope without copying the style of play of the leading Western teams. “Perhaps there’s no other team in the world, who would be fighting with the same dedication to please the leader and to bring fame to their motherland,” Kim Jong Hun said. North Korea secured its first World Cup berth since 1966. The other automatic qualifiers from Asia are Japan, South Korea and Australia. The Saudis will face Bahrain in a two-game regional playoff in September, with the winner facing Oceania champion New Zealand for a World Cup slot. 1. The Bleacher Report offers a satirical take. 2. More coverage of the game here. 3. If you have not seen The Game of Their Lives, you probably should. YouTube has a trailer here. North Korea inched closer to their first World Cup finals since 1966 with a gritty 0-0 draw against Iran on Saturday. But it was not the result newly appointed Iran coach Afshin Qotbi was looking for, with their World Cup fate now hanging in the balance. The draw edged North Korea level with South Korea on 11 points in Group B, but they have played two games more. The South take on United Arab Emirates in Dubai later Saturday. Saudi Arabia, who do not play Saturday, have 10 points with Iran languishing on seven points and facing a home game against UAE next Wednesday and then a tough trip to Seoul on June 17 — matches they must win. Despite the draw North Korea, at the centre of international criticism after its second nuclear test, appeared disappointed after the game in front of a full house in Pyongyang, with players slumping to the ground in frustration. But ultimately it moved them closer to ending their long wait for another crack at the World Cup. Time also covers some of the drama behind this game. South Korea advances to the next round. A spokesman for the DPRK Football Association, in a statement released on Sunday as regards the serious incident that happened at the football match of the final Asian qualifier of 2010 FIFA World Cup between the DPRK and south Korea held in south Korea, expressed the expectation that the FIFA would examine the whole process of the match and take an appropriate measure. Main players of the football team of the DPRK could not get up due to serious vomiting, diarrhea and headache since the night on March 31, just a day before the match. They were healthier than any others in ordinary days and they had their meals only in the place they put up. They were enthusiastic in the training till that day. It can be said that it was beyond all doubt that the incident was a product of a deliberate act perpetrated by adulterated foodstuff as they could not get up all of a sudden just before the match. Moreover, the Oman chief referee was so seriously biased in refereeing at the match that he insisted the ball headed by our player into the goal mouth at about 6 minutes after the start of the second half of the match was not the goal. He also declared that the foul committed by the rival side about 3 minutes before the end of the match was our player’s though it was an obvious foul on the part of the rival side, thus resulting in the loss of our team. It was something surprising that the Japanese refereeing supervisor tacitly connived at this shameless behavior though he was obliged to ensure the fair refereeing. The match thus turned into a theatre of plot-breeding and swindling. It is as clear as noonday that it was a product of the Lee Myung Bak group’s moves for confrontation with the DPRK and a deliberate behavior bred by the unsavory forces instigated by it. We sternly condemn the attitude of the Lee group, which runs the whole gamut of evil doings in violation of the noble idea of sports after betraying its fellow countrymen, as anti-reunification and treacherous moves to incite confrontation with the DPRK. We strongly urge the south Korean authorities to own full responsibility for such serious incident and promptly make an apology for what happened. The DPRK Football Association will always remain true to the FIFA which regards friendship and peace as its mission and the sports idea. It once again vehemently denounces the south Korean authorities and the unsavory forces responsible for the incident and will closely follow their future acts. North Korea protested to world governing body FIFA on Sunday that they were the victims of a South Korean plot which caused them to lose a World Cup qualifier 1-0 to their rivals in Seoul last week. The North Korean FA said in a statement that their players’ food had been tampered with and that the referee was biased. “The match thus turned into a theatre of plot-breeding and swindling,” the statement said. The statement said FIFA should “examine the whole process of the match and take appropriate measures” and called on South Korean authorities “to own full responsibility for such serious incidents and promptly make an apology”. UPDATE 8 (2009-4-1): South Korea tops the DPRK in Seoul. Final score 1-0 . The Koreans hold first and second spots in Group B. Read more here and here. Question: How many other countries would like to be divided so they can send two teams to the World cup? 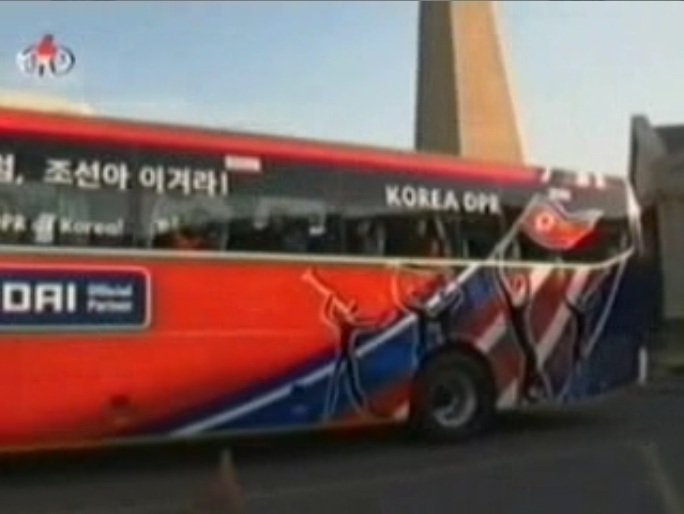 UPDATE 7 (2009-3-29): The North Korean team has arrived in Seoul for the April 1st inter-Korean qualifier match. According to Fifa.com, the DPRK have a June 6th game against Iran and a June 17th game against Saudi Arabia. UPDATE 6 (2009-3-28): North Korea looking good for a first World Cup appearance since 1966. Pak Nam Chol and Mun In Guk gave North Korea a big push in the direction of South Africa on Saturday afternoon in Pyongyang by giving their team a 2-0 win over UAE in their 2010 World Cup qualification clash. UPDATE 5: FIFA has set the September 10 DPRK-ROK World Cup qualifying match in Shanghai (again). Pyongyang is still reluctant to raise the South Korean flag in Kim il Sung stadium. Someone please tell the DPRK foreign ministry that this does not reinforce the image of social strength that the North works so hard to cultivate. Read more here. Goal.com makes the claim that these political decisions also hurt the team’s chances of winning. FIFA is neutral, and it will not sanction the DPRK since both teams agree to play the game in Shanghai. More on their decision can be found here. UPDATE 4: As reported below, North and South Korea were both drawn into Group 3 in Round 3 qualifying matches for the 2010 World Cup in South Africa. North and South Korea tied 0-0 in both games against each other. However, due to Pyongyang’s refusal to raise the South Korean flag and play the South Korean national anthem, the initial Pyongyang home match was moved to Shanghai, where yours truly was able to attend. Pyongyang also tried to have the Seoul home match moved to another city or country before finally abandoning politics and just letting their boys play. Well, FIFA has drawn groups for Round 4 qualifiers, and both North and South Korea have been chosen for Group 2. This means Pyongyang will have another opportunity to host the South Korean national football team—along with their flag and anthem. What are the odds that Pyongyang will actually host their home game this time around? Matches are scheduled for September 10 and January 4, 2009. Venues TBD. Amid an atmosphere of goodwill, South Korea and North Korea tied 0-0 in a 2010 World Cup qualifier Sunday. With both teams already through to the final round of qualification, the match had the feeling of a friendly from start to finish. The visitors were given a rousing reception when they appeared for warmups. The respective anthems were played before 55,000 fans in Seoul’s World Cup Stadium, including 500 North Korean supporters. At the final whistle, fans applauded both sets of players. Both teams finished with 12 points, though South Korea took the top spot in Group Three due to superior goal differential. The draw for the final round of Asian qualification will be made on June 27 and matches begin in September. UPDATE 2 (2008-6-14): North Korea tops Jorday 2-0, next stop Seoul! North Korea reached the final stage of Asian qualifying for the 2010 World Cup with a 2-0 win over Jordan on Saturday, ensuring neighbor South Korea also progressed. Two goals from Hong Yong Jo gave North Korea 11 points from 5 games, meaning it can finish no lower than second in Group Three, and therefore progresses to the final 10-team round that will decide Asia’s berths at South Africa 2010. North Korea travels to Seoul for the final match to take on South Korea on June 22. The match had been in some doubt as North Korea officials demanded that the game be held in a third country or on the southern island of Jeju. 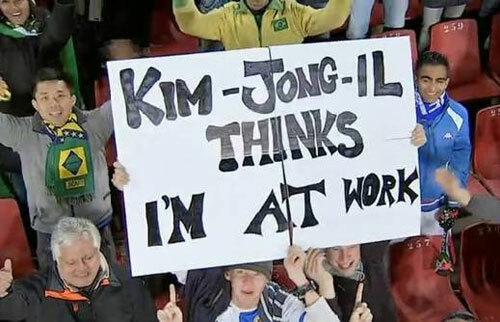 The Korean Football Association refused to compromise and North Korea finally agreed Friday to play the match in Seoul. The team will arrive in the South Korean capital on June 19. UPDATE 1 (2008-6-11): North Korea’s World Cup Football shenanigans made headlines earlier this year when Pyongyang refused to raise the South Korean flag and play its national anthem in a regulation match. FIFA responded by moving the game to Shanghai, China, where North Korean Economy Watch was able to attend. Well the DPRK men’s team has risen to second place in its qualifying bracket (see original post below), and now that it has only two games left, Pyongyang again inserts politics into sport. The South’s Korea Football Association (KFA) had a meeting with its North counterpart in Gaeseong Tuesday, and the North side asked the KFA to host their match, scheduled for June 22 at Seoul World Cup Stadium, in another country due to a cold relationship between the two sides and ongoing rallies in Seoul. The North Korea Football Association also asked Mohamed bin Hammam, the president of the Asian Football Confederation (AFC), last month to change the site of the June 22 match. However, FIFA, which has already selected referees and match supervisors, ignored the North’s pleas, and the KFA also stated that it would stick with the original schedule. South Korea’s action compelled the North to propose Jeju Island, where the North’s under-17 squad participated in the U-17 World Cup last year, as an alternative. But the original plans were not changed. ORIGINAL POST: The North Korean national men’s team toppled Turkmenistan 1-0 last week in the 2010 World Cup qualifier. With the game heading toward a goalless stalemate, Choe Kum Chol scored with 19 minutes remaining to put the North Koreans in sight of a place in the final round of qualification. North Korea now has 8 points, putting the team at the top of group 3. On June 14, North Korea will host Jordan in Pyongyang. On June 22, North and South Korea will meet in Seoul. For coverage of their March game in Shanghai, click here. This entry was posted on Wednesday, June 16th, 2010 at 8:00 am and is filed under Football (soccer), South Korea, Sports. You can follow any responses to this entry through the RSS 2.0 feed. Both comments and pings are currently closed.